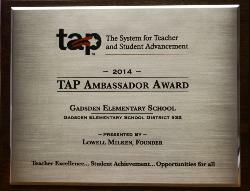 Gadsden Elementary School has been recognized with the TAP Ambassador Award which honors schools that has gone beyond its campus to represent the principles of the TAP system and assist others in the state and region. For its school-wide student growth, and teacher and administrator commitment and implementation to the TAP System as part of the Arizona Ready-for-Rigor Project, Gadsden Elementary School was honored as the runner-up in the prestigious educational “Golden Bell” Elementary (Pre-K through grade 6) category, presented by the Arizona School Board Association. Recognition as a National Center for Educational Achievement (NCEA) Higher Performing School Indicates a school’s deep commitment to raising student achievement and putting more students on the path to college and career readiness—regardless of socio-economic barriers or any other obstacles that might otherwise impede success. 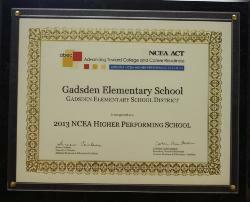 Gadsden Elementary School stands out as a shining example of what can be achieved when staff, students and parents work together toward a unified goal of better preparing students for life after high school.